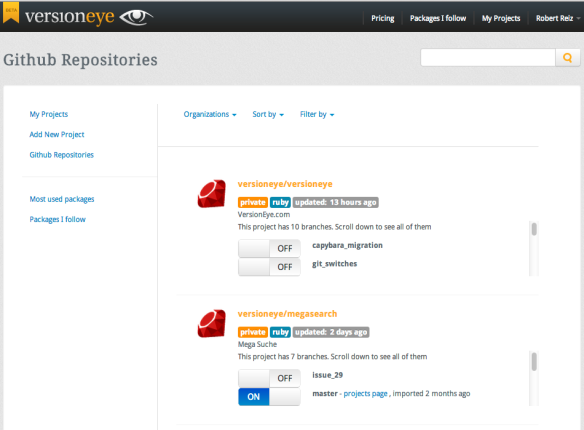 Two weeks ago we put the GitHub Single Page app at VersionEye online and got a lot of feedback from the community. We rearranged the design and you can find the toggle component on the left side now. All branches from a repository are in a scrollable div. We automatically sort repositories by your last activity and put the repository you have worked on most recently on the top. We fixed the bug that was in the filter when switching between organisations. As in all things, we rely on your feedback and support, so please feel free to send your comments to us.